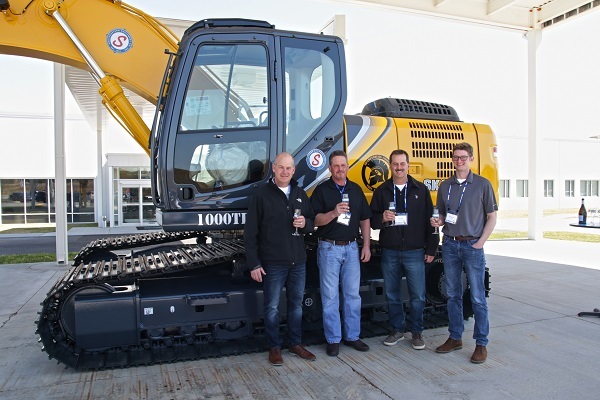 Southeastern Equipment Co. has sold the 1,000th excavator manufactured by Kobelco Construction Machinery USA’s plant in South Carolina. The excavator was purchased by A Crano Excavating Inc., a long-time Southeastern Equipment partner in North Canton, Ohio. This machine marks the 25th Kobelco excavator that the family-owned business has purchased. Hess and other members of the Southeastern Equipment team celebrated the occasion with Kobelco representatives and local government officials in Moore, SC. Southeastern representatives included: Chris Kurz, North Canton branch manager; Scott Hartzell, North Canton sales representative; and Charla Mayhew, marketing manager. Representatives from A Crano Excavating also joined the group: Jim Riter, president; Raymond Riter, treasurer; Jimmy Riter, estimator; and Mike Jones, superintendent. The 1,000th excavator is the Kobelco SK210LC-10, a model known for its efficient hydraulic system, durable boom, and enhanced productivity. Digging volume beats previous models by 7%. Keep up with Kobelco here!